Most of us like to think we’re cultured to some degree. Unfortunately, most of us lack the actual knowledge and understanding required to qualify as being cultured in any real way. Google is trying to change all that, with new efforts designed to turn us all into budding art experts Why the Internet Doesn't Get Art Why the Internet Doesn't Get Art It pains me to say this but — and I know this is a broad generalisation — the Internet just doesn't get art. Most online discussions of art, especially modern art, miss the point entirely. Read More . Every month, Google handles 500 million searches to related to artists and works of art. This is an astonishing figure which brings home how many of us want help understanding art on a deeper level. Thankfully, Google heeded the call, bringing together its brightest and best to help us all. As outlined on The Keyword, Google’s Art and Culture team has joined forces with Google Search engineers. Google already offers a dedicated Art and Culture app which lets you explore museum pieces and art collections. This new effort brings that information across into the mainstream. This means that every time you search for an art-related thing you’ll be presented with more information about the art and/or artists involved. This include more information on the life and times of the artist, details about their famous works, and the option to see those works in situ. You’ll also be able to embark on virtual tours. Hundreds of museums around the world have opened their doors to Google, letting them capture images from inside. So you can walk around the museums in virtual form, soaking up some culture from the comfort of your own home. 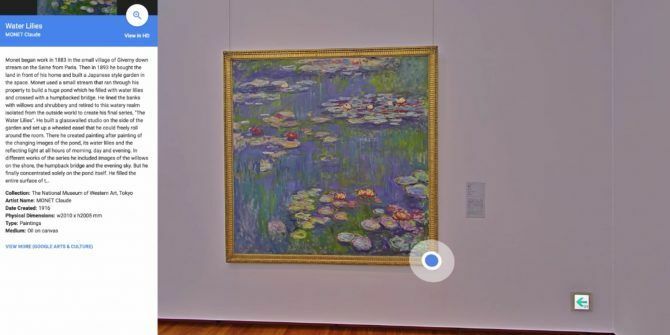 Google has added clear annotations to the walls surrounding famous works of art, giving you the opportunity to learn more about them. And 15,000 works of art have been scanned in high-resolution, allowing you to zoom in and see every last detail right down to the brushstrokes. This is a fantastic effort to educate the masses 10 Educational YouTube Channels Made for Marathoning 10 Educational YouTube Channels Made for Marathoning YouTube is now the go-to place for nearly any video you could want -- and that makes it a wonderful educational resource. Especially if you binge-watch the best YouTube channels out there. Read More , and Google deserves credit for embarking on such a mission. The greatest works of art should be available to all, and this is Google opening art up to people who would otherwise not have the opportunity to see it in person. Bravo, Google, bravo. Do you regularly search for information on artists or their works of art on Google? Will you be making use of Google’s new efforts to educate the masses? Do you consider a virtual tour of an art gallery as good as the real thing? Please let us know in the comments below! Explore more about: Google, Google Search, Google Street View.